In his new book, 50 American Revolutions You’re Not Supposed to Know, Mickey Z has authored yet another incisive examination of the political and social landscape. This time his focus is on people’s victories that have been won throughout American history, reminding us that even in the bleakest of times power is not absolute. 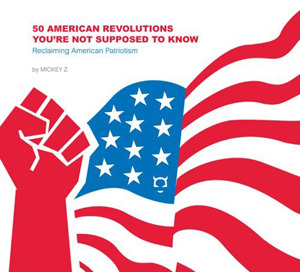 Mickey Z has chosen fifty acts of political, social, and cultural rebellion and demonstrates how these have changed the course of American history and society. The book would make an ideal gift for a young person laboring under the misapprehension that history is nothing more than a dry memorization of dates. For here Mickey Z paints in the most vivid manner possible that history is in fact a constant and seething struggle for justice and progress against the mighty forces of reaction. More importantly, the book is an argument against complacency, showing that change is not only possible but necessary. For seasoned political readers, some of the stories Mickey Z relates may be familiar, but the broad diversity of examples ensures that every reader will find much to learn. Perhaps more to the point, those who are discouraged by the current political environment can find inspiration as Mickey Z reminds us that history never sleeps, for his book is nothing less than a fifty-first American revolution. Q: The concept behind your latest book is an interesting one. This is a difficult time politically, and your book serves as a salutary reminder of the myriad ways in which victories can be won. What led you to choose this topic, and what did you hope to convey to your readers? Mickey Z: While this subject matter is close to my heart, in this particular case I didn’t choose it. It chose me. The publishers at Disinformation had an idea for a book that “reclaimed” the concept of patriotism from the jingoists and they asked me to write such a book. Once I took on the project, what I was hoping to convey was a sense of historical context through a melding of political, cultural, and social events that make up a long thread of dissent, innovation, and even revolution. Q: Your book does achieve those objectives quite successfully. Any list of “fifty American revolutions” is inevitably bound to be personal. Part of the fun of reading your book is comparing your list with one’s own candidates, and dwelling on the reasons behind your choices. I found it refreshing that your book went beyond overtly political struggles and included social and cultural events as well. What are your thoughts on the role of social and cultural “revolutions” in transforming society? Mickey Z: You’re right, the “revolutions” that ended up in my book are shaped by personal preference, and part of who I am is the wide range of interests I enjoy. I think it is crucial to recognize how powerful and pervasive the attempts at indoctrination are in U.S. Outside a very small “radical” community, most Americans are not receptive to positive stories about, say, violent insurrections. However, the same folks who reflexively dismiss such episode as “anti-American” admire the rebellious spirit of a Katherine Hepburn or Lenny Bruce or Charlie Parker or Public Enemy. From such admiration can grow a greater openness to challenging the cookie-cutter, one-size-fits-all formula being sold to us by corporate pirates. It certainly worked that way for me. Q: That leads me to my next question. In Stan Goff’s latest book, Full Spectrum Disorder, he writes of the importance of working-class intellectuals taking up the pen. You are an exemplar of what Goff was calling for. I would like to know more about how admiration of social and cultural rebels led in your case to a growing political consciousness. Also, I am interested in knowing how you developed your wide-ranging interests. People aren’t “taught” to be interested in the wider world, and it often takes a catalyst for that to happen. Mickey Z: Well before I had ever heard of Noam Chomsky or Emma Goldman, I was taken by Jackson Pollock, William S. Burroughs, Patti Smith, and others of their ilk. I found their style intoxicating . . . thumbing their noses at convention. Perhaps my greatest influence in this realm was Bruce Lee (a maverick in every sense of the word) and my earliest writing was for martial arts publications in which I’d challenge the rigidity of tradition. Without realizing it, I was laying the groundwork for a radical transformation. As for my wide range of interests, I was fortunate to be encouraged by my family and, by not following a traditional academic route, I was able to read and study as I pleased. It’s impossible to know now if my transformation would have been slowed or expedited had I attended college. Q: I see that your first articles appeared in martial arts publications. What initially prompted you to start writing? And how did you decide to branch out and start addressing political issues? Mickey Z: I identified as a writer before I was a martial artist and waaaaaay before I became radical. I’ve always felt comfortable expressing myself through the written word, so it was only natural that my writing would reflect what was going on in my life. Looking back, however, I now see that my early fiction and even my martial arts writing were political in their own way. It’s as if something was there all along . . . waiting for the spark. Q: I believe your own work has been the spark for many others and I know you have a large and devoted audience. The amount of writing you are able to accomplish is remarkable for someone who has a regular job. What sustains you through all those long hours of writing? Mickey Z: I’m lucky to have had my writing create a situation where I get to interact with an array of fringe characters like myself. My blog site plays host to the most amazing visitors and my inbox is home to a never-ending flow of provocative e-mails. As for my output, while some may say I choose quantity over quality, I just think I do what comes naturally. Writing is never a chore. Never boring. No writer’s block for yours truly. Kurt Vonnegut has come up with as exemplary a rationalization as I’ve ever heard for being a writer in the Age of TV: “Many people desperately need to receive this message: I feel and think as much as you do, care about many things you care about, although most people don’t care about them. You are not alone.” I’m honored to be a part of that noble idea. Mickey Z: I truly feel this book is unique in terms of format and accessibility. Fifty short bites with the potential to enlighten, inspire, and awaken. I believe this book can be a powerful refresher course for any subversive, but it may be an even better gift in terms of introducing new ideas to the unconverted (especially in the post-Katrina environment). If you know someone who still uses the phrase “liberal media,” get him a copy. If you know someone who still thinks the U.S. is in Iraq to spread democracy, get her a copy. If you know someone who still believes that terrorists hate us because we’re free, get him a copy. If you know someone who thinks it’s useless to resist, get her a copy. What better gift to give than encouraging someone to embrace the subversive pleasure of thinking for oneself? Gregory Elich has published numerous articles on US foreign policy, including “Zimbabwe’s Fight for Justice,” “Assault on Iraqi Women,” “Targeting North Korea,” and “The Arrogance of the Imperial Mind.” He is the author of a forthcoming book entitled Strange Liberators: Militarism, Mayhem, and the Pursuit of Profit.